Warrenpoint Town came from behind to beat Championship side Institute in the League Cup quarter-final at Drumahoe. Institute took a deserved lead when Gareth Brown drilled into the bottom corner from an Aaron Harkin pass. 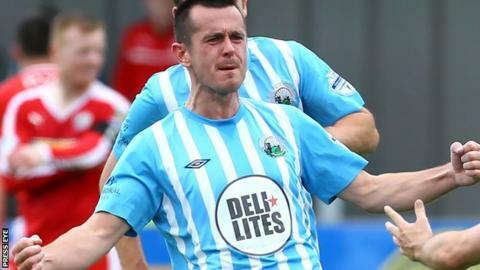 Mark Hughes rounded keeper Michael Lynch and tapped in to equalise for a Warrenpoint side which has lost its last 10 Premiership games. Daniel Hughes won it with a 63rd minute penalty after Conor McDonald was fouled by Graham Crown. Town boss Barry Gray denied weekend speculation that he had quit the job as he celebrated a much-needed victory. "I just went away for a couple of days to get my head straight but I've the full support of the players and directors," he said. "The equaliser before the break was crucial, it changed the complexion of the game. "It's fantastic - it's the first time the club has reached the semi-finals of a senior cup and it is also a welcome distraction from the league."